HOUSING MINISTER EOGHAN Murphy today expressed his appreciation for the “whole-of-government” support during the severe weather last week. While he acknowledged the situation is not over for everyone around the country, the minister told his Cabinet colleagues that the management of the cold weather conditions “went to plan”. 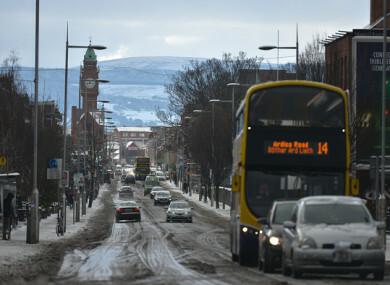 He acknowledged the coordinated response to Storm Emma, which remain ongoing in Wexford, Wicklow and Kildare – areas particularly impacted by deep snow drifts. While the thaw has set in for most areas, Murphy has now asked all departments to begin totting up the estimated cost for economic loss and damage incurred during the cold snap. Murphy said the top priority now is to liaise with local authorities regarding the extensive damage to national, regional and local roads. The Department of Housing, Planning and Local Government intends to reimburse local authorities for the “exceptional and unbudgeted costs” incurred during the severe weather. Businesses that have incurred significant costs are being urged to contact their insurers in the first instance. Meanwhile, the Humanitarian Assistance Scheme in place for householders is also available, said the minister. Any householder who may be affected by flooding over the coming days and who requires support should contact the community welfare service. Agriculture Minister Michael Creed told Cabinet today that he will continue to monitor the farming situation and “will be particularly vigilant should any serious difficulties emerge”. The Department of Agriculture Food and the Marine operates an emergency phone line for animal welfare issues, such as immediate fodder shortages (Anyone with concerns can call 0761 06440). The Cabinet was also informed that the health service remains significantly affected. There has been a significant increase in the numbers of patients on trollies due to an increase in patients presenting at hospitals, combined with a backlog of hospital discharges. Cancelled outpatient appointments are due to be rescheduled, however, it is expected that it will take up to two weeks for health services to return to normal. While many are now dealing with the aftermath of the snowstorm, many local and rural roads remain inaccessible especially in the southeast and west Wicklow. It’s understood that local authorities are directing spare capacity to worst affected counties in order to assist with the response in these areas and the restoration of essential services. The main issue now for the public at large is the numerous leaks appearing in the water supply network, the Cabinet was told today. Water restrictions have already been put in place. Email “Government wants to know how much the clean-up bill for Storm Emma is going to cost”. Feedback on “Government wants to know how much the clean-up bill for Storm Emma is going to cost”.